﻿"I really like the clinic format - a little theory, a little practical. I also like that auditors have the opportunity to feel the timing etc through simulations, and then watch "real time" with the handlers and horses"
"Very inclusive and warm. 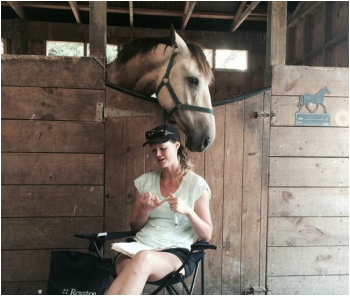 It is the first time I have attended a horse clinic where I felt the trainer knew how to teach adults. As a trainer of adults I really appreciated that." "You had a great balance between letting people actually do stuff on their own, yet stepping in to help when really necessary. I appreciated that you did not just jump in at the first sign of a problem but let the person try first. And I thought you were amazingly tactful when needed. " "I thought Bex’s teaching style was fantastic - very easy to interact with, easy to understand and extremely knowledgeable." 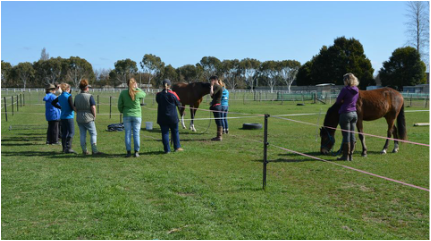 "It was very cool, I learnt so much and my horse loved it!!! Bex was a great teacher, very interactive and focused on our issues"
"This weekend ​we have been lucky enough to have a 2 day clicker training clinic with Bex Tasker. 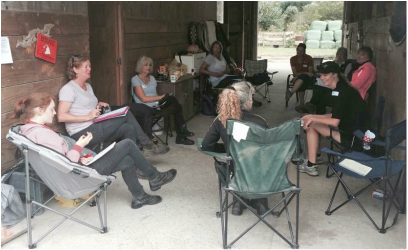 Most of us were basically new to clicker training - but highly motivated to learn! What a weekend - talk about brain fade at the end of it! Thankfully she had reading material available for us to take away with us, to remind us of what we'd just done. Had some fantastic progress with the horses, and a huge amount of fun and laughter. If anyone is considering doing a clinic (or organizing one!) with Bex, I would strongly suggest you get on and do it. We intend getting her back." "I have just started clicker with my horse under instruction with Bex Tasker. Every day he comes up with fantastic progress - clicker seems to `click' with the way horses associate with life and us! ​I have virtually erased his mouthiness and nipping from a score of 9-10 (as in bad) to 2-3 in just three weeks. Totally recommend the journey."